Dr. Charles A. Porter III of Charlotte believes that all patients should be able to experience great dental health without having to feel fear or anxiety. This is why he offers sedation dentistry options to reduce fear, anxiety, and stress during dental procedures. One particular option for dental sedation is oral conscious sedation. Let's look into this option for anxiety-free dental care right now. Oral conscious sedation refers to the use of oral medications to help patients achieve a relaxed state. This can be done with prescription pills or liquid medication which is taken before the patient visits the practice, taking effect by the time that they are in the waiting room. There are a few major advantages to undergoing oral conscious sedation. 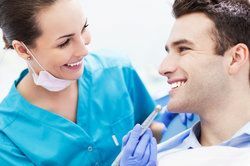 No Needles - Oral conscious sedation involves no needles, meaning that there is no discomfort when undergoing the sedation process, and no undue anxiety is produced by the process either. Relaxation Before Arriving at the Practice - Patients take the sedative medication before they arrive at the practice, which means that they are in a relaxed state before the dental visit even begins. Safe and Easy to Administer - Before prescribing any oral sedative, we will carefully determine eligibility for oral conscious sedation and if there are any contraindications that need to be taken into account. The best candidates for oral conscious sedation are people who suffer from dental anxiety or dental phobia. They should be in generally good health to tolerate sedation dentistry drugs and have realistic expectations about the process and what it can achieve. Patients will take their oral sedative at home before visiting the practice. Since the patient will not be in any state to operate a vehicle while experiencing the effects of these sedative drugs, he or she will need a loved one to assist them in arriving at the dental practice. The treatment is then performed, with the patient's general health and vitals monitored as treatment progresses. At the end of treatment, patients will still not be in a fit state to operate a vehicle. This is where the loved one plays a role again, ensuring that the patient arrives home safely. If oral conscious sedation proves to be a poor decision for the patient's needs, there are other kinds of treatment to consider. For one, nitrous oxide (laughing gas) can be inhaled for patients to achieve a more relaxed state. IV sedation can also be used as needed to introduce the sedative directly into the patient's bloodstream. All options for sedation can be discussed in greater detail during the consultation process. If you would like to learn more about oral conscious sedation and how it can be beneficial to you, we encourage you to contact our dental care center today. The entire team here looks forward to meeting you in person and helping you achieve excellent dental health without undue anxiety and stress.